Objective: This study aims to examine markers of coagulation activation and their possible clinical associations in sickle cell disease (SCD) and thalassemia. 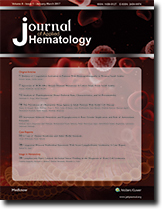 Materials And Methods: This study was conducted on patients with hemoglobinopathy followed up at King Abdulaziz University Hospital between October 2010 and November 2011. Demographic and clinical data were collected for all participants. The independent t-test was used to compare two group means, while the one-way analysis of variance test was used to compare more than two group means. Results: The study included 122 hemoglobinopathy cases and 34 controls. Protein C, protein S, antithrombin, and activated protein C resistance (APCR) were significantly lower in patients with hemoglobinopathy than in the control group, while D-dimer levels were significantly higher (P < 0.001 for all comparisons). Patients with SCD had significantly higher protein C and D-dimer levels than those who had thalassemia (P < 0.01 for both). Arterial and venous thromboses were more prevalent in patients with SCD (12.5 and 18.7%), compared to patients with thalassemia (9.3 and 2.3%, respectively). Cases had significantly lower protein C, protein S, antithrombin, and APCR values (P < 0.001 for each), and higher D-dimer levels (P = 0.016) than male controls. There was no significant difference in markers of coagulation activation between patients who had undergone splenectomy compared with those who had intact spleens. Conclusion: Natural anticoagulants were significantly lower, and D-dimer levels were higher in Saudi patients with SCD and thalassemia compared to healthy controls. The procoagulant phenotype was more pronounced in patients with SCD and was associated with a higher prevalence of clinical thrombosis, compared to patients with thalassemia in this population. Background: The BCR-ABL1 tyrosine kinase domain mutation constitutes a major cause of resistance to the tyrosine kinase inhibitors in patients with chronic myeloid leukemia (CML). 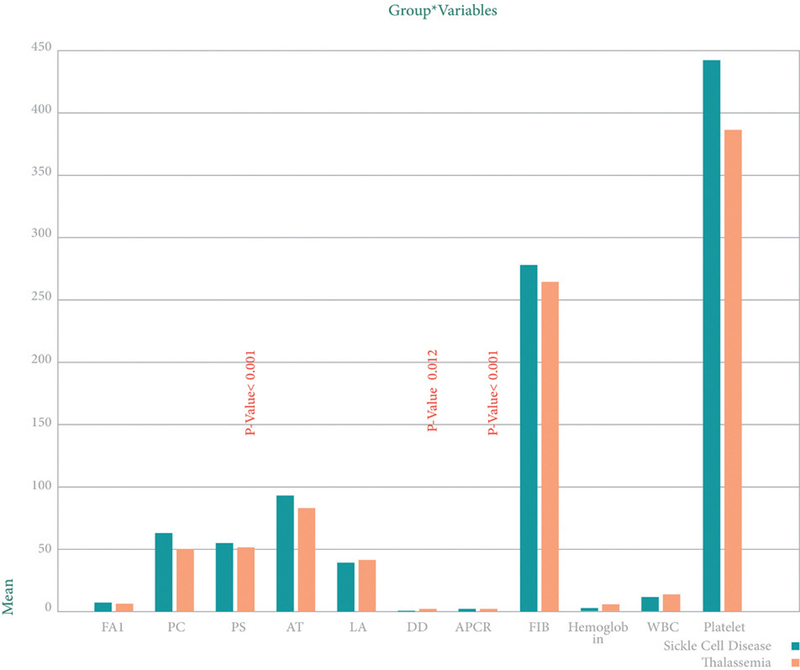 In this retrospective study, we assessed the ABL kinase domain mutation in 123 patients (61 females and 62 males) aged 10–79 years (median age of 50 years). These patients were referred to our clinics at King Faisal Specialist Hospital and Research Center (General Organization), Riyadh, Kingdom of Saudi Arabia during period (2011–2014). These patients had Philadelphia-positive CML displaying either failure to tyrosine kinase inhibitor (TKI) or suboptimal response with increased BCR-ABL1 levels through serial monitoring by using quantitative Real time PCR. Methods: The mutation analysis was performed on RNA extracted from Peripheral blood samples after the amplification of the BCR-ABL1 transcript by nested PCR followed by direct sequencing of the BCR-ABL1 kinase domain including the residues (243–487). Results: Of 123 patients, 119 adults and four pediatrics were analyzed. 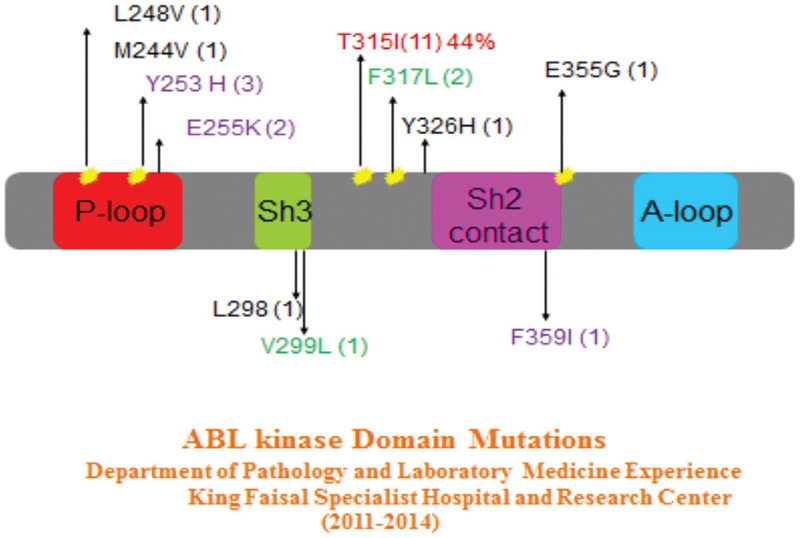 From the total, 25 (20%) were tested positive for 11 different mutations in the ABL1 kinase domain (11 patients with T315I, 3 with Y253H, 2 with E255K, 2 F317L, and 1 patient having each of the following mutations: F359I, E355G, V299L, L248V, L298, M244V, and Y326H). The duration from the diagnosis to mutation detection ranged between 3 and 144 months with a median duration of four years. Conclusion: Despite the retrospective nature of the study and relatively small sample size of a single center analysis, the mutation frequency is in line with similar reported studies from other parts of the world. Introduction: Plateletpheresis is a procedure included in donor apheresis in which the donor blood is passed through an extraction machine, the platelets are extracted, and the remainder is returned into the circulation. Donor selection is important because donors are the only source for meeting blood product needs. In our study we aimed to evaluate deferral reasons in applications for plateletpheresis donation and reveal determine the preventable ones among them. Materials And Methods: The persons who were admitted to our Blood Center to be plateletpheresis donors during the period of six month, after a demand/request for platelet suspension was issued by the clinics. Their eligibility for being plateletapeheresis donors was decided. Results: A total of 1098 persons have applied to be plateletpheresis donors; 1045 were male and 53 female. A total of 787 persons were found to be eligible for being plateletpheresis donors; 772 were male and 15 female. 891 units of apheresis platelets were obtained from apheresis donors, including double units collected from 104 of them. Applications of 311 persons were deferred due to various reasons. The most common reason for donor deferral was inappropriate vascular access in 80 persons (25.7%, 69 males, 11 females). This is followed by abnormal laboratory values in 57 persons (18.3%) and drug use (most commonly analgesics) in 46 persons (14.7%). Discussion: During the assessment of blood product donors, proper selection of the candidates should be considered very carefully in order to not to harm the donor but to supply the demand of the recipient properly. When the deferral reasons were evaluated, improvement of in-hospital technical reasons and education sessions for people in order to increase the social awareness may substantially decrease the deferral rates. Purpose: Although few previous studies suggested an increased prevalence of obstructive sleep apnea (OSA) among children with sickle cell disease (SCD) compared to others, there are little data regarding this association in adults. In this study, we aimed to investigate the prevalence of OSA among the patients with SCD and its risk factors. Materials And Methods: This cross-sectional, observational study was conducted at a specialty hematology clinic. From December 2013 to July 2014, all the patients with SCD and chronic anemia were approached. Data were collected on the risk of OSA using the Berlin questionnaire, and the data on daytime sleepiness were collected using the Epworth sleepiness scale (ESS); medical history of the patients was also obtained. The objective diagnosis of OSA using polysomnography was performed in a subsample of the study population. Results: The study included 106 patients, 44.3% with SCD and 55.7% with other types of anemia being used as a comparison group. Among the patients with SCD, 14.9% were at a high risk of OSA, and 23% were confirmed to have OSA, whereas 10.1% and 16.7% of those in the comparison group did, respectively. However, there were no statistically significant differences between the two groups. Mean scores of risk factors for OSA among the patients with SCD with OSA were 28 years for age, 22.1 kg/m2for body mass index, 14.5 inches for neck circumference, 122 mmHg for systolic blood pressure, and 6.67 for ESS score. Conclusion: Although not different from chronic anemia, the OSA is a common, coexisting disease in the patients with SCD. Furthermore, it is suspected that the traditional screening tools may miss potential cases of OSA in the SCD population. Introduction: The gender implication of the effects of artesunate on hematological parameters and blood glucose is not well understood. The present study investigated the effects of artesunate on some hematological parameters, blood glucose, and antioxidant enzymes in both the sexes. Materials And Methods: A total of 35 male and 35 female Wistar rats were randomly divided into five groups (n = 7). Group one rats received distilled water; groups two and three received 2.90 mg/kg artesunate on the first day and 1.45 mg/kg artesunate from the second day until the fifth and fifteenth days, respectively; and groups four and five received 8.70 mg/kg artesunate on the first day and 4.35 mg/kg artesunate from the second day until the fifth and fifteenth days, respectively. Results: The results of this study showed that an increase in G-6-PD activity alone prevented hemolysis in the male, but not in the female rats following a short duration of treatment. However, after a longer duration of treatment, a synergy between gucose-6-phosphate dehydrogenase (G-6-PD) and catalase prevented hemolysis in the female rats, whereas hemolysis occurred in the male rats due to the absence of an increased G-6-PD activity. 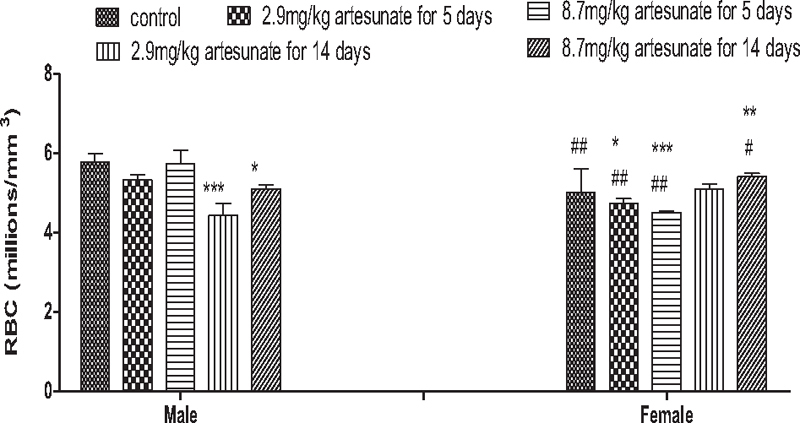 Probably due to hormonal differences, artesunate reduced fasting blood glucose in the females, but it was either hypoglycemic (at low dose) or hyperglycemic (at high dose) in the male rats. Discussion: In conclusion, the present study suggests that a duration-dependent difference exists in the onset of artesunate-induced hemolysis and the response of antioxidant enzymes in the male and female rats and that following longer duration of treatment, hypoglycemia could be sustained in the female rats while counterregulatory mechanism(s) could be triggered in the male rats. A 2-year-old boy presented with delayed speech, hydrocephalus, skeletal deformities, and right-sided hydrocele. On investigation, the peripheral smear revealed Alder–Reilly anomaly in the neutrophils suggesting mucopolysaccharidosis (MPS). Molecular studies were performed, which showed results indicative of diagnosis of either MPS type I Hurler–Scheie or type II Hunter syndrome. Enzyme assays confirmed the diagnosis of MPS type II Hunter syndrome. We present this rare case to highlight the association of Alder–Reilly anomaly in Hunter syndrome and MPS. Radioulnar synostosis (RUS) is a rare, congenital bone anomaly characterized by fusion of the radius and the ulna. RUS occurs more often in males than in females and is bilateral in 50% of the cases. More than 400 cases of RUS have been described since 1793. 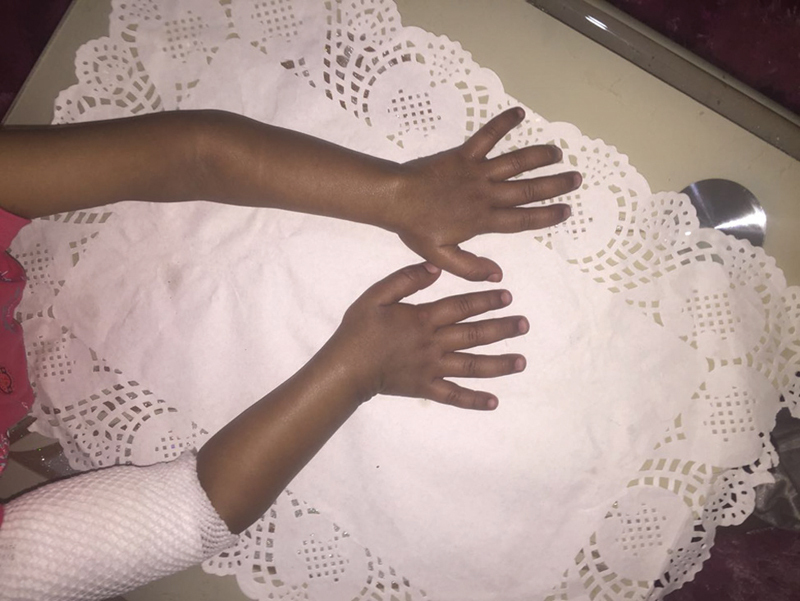 In the literature, seven cases with RUS and hematologic problems were reported, including the newly named radioulnar synostosis-hematology syndrome. Globally, this is the first reported case of RUS associated with malignancy, that is, acute lymphoblastic leukemia, in a 3-year-old male child.